Just a little public safety note that I discovered, and I am not particularly angry yet, because for some reason I had made a back up before I tried to upload my file to keep a back up safe. There seems to be a bug when using iCloud to backup a project file in GarageBand iOS that destroys your original local copy while also failing to create the backup. So I use Windows PCs primarily, so I know that I cannot back up my GarageBand files directly to it. There is some evilness going on where Windows sees the song’s .band back up file as a folder, and I have never seen a way to get around it. That means if you make a back up by having GarageBand create one for iTunes, then you have to sync with iTunes on a Mac in order to see it correctly and get it off of the iPad. So generally I create a back up on iCloud. And this recent instance I had first copied the file that I wanted to back up inside GarageBand iOS, because I thought I might do some additional editing on it but I wanted to keep the original version safe. So I trigger the iCloud backup and it spun for a little bit and then gave me this error message: it couldn’t back it up because it was damaged or in an incompatible format. In fact what had happened is an 8-kilobyte file was created in iCloud and it also overwrote the original project file ON THE IPAD. If I had not made a copy, my work would have been destroyed. 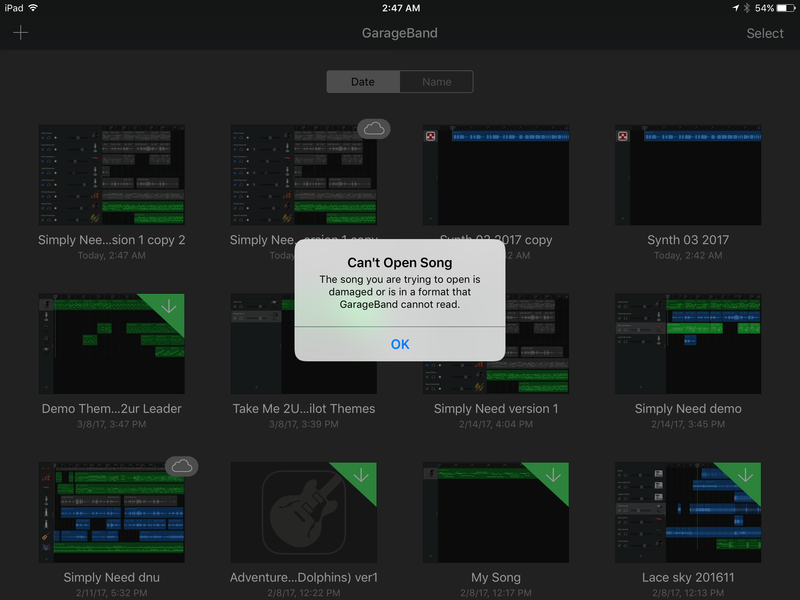 After some experimentation and troubleshooting — with many copies, thank you very much — I discovered that it was happening when I was uploading to the subfolder I created in iCloud for my music; it’s called garagebandmusic. No fancy spaces or anything. When I copied the GarageBand project file to the main folder file it uploaded successfully. At this point I am not moving it inside iCloud to the folder that I want to use, because I don’t know what the bug is. But I will be hooking my iPad up to a Mac as soon as possible and copying everything off again to have a safe back up. If you don’t have space on your device I would suggest at the very least making a high-quality copy of your song and mailing it to yourself, or making “stems” which is exporting each track separately from the mix, by muting each track in turn and creating a full length audio file for each track individually. So tedious, and that’s how I used to have to make a backup of all my songs before the iCloud feature was added, because it let me use the tracks in something else, remix later and have some flexibility, although I did lose the ability to edit MIDI data that way, since it was converted to the final audio file. It’s better than losing everything though. P.S. If you are writing music for video or film, stems are terrifically useful alongside the final mix, because you can steal a chord from one section, repeat a bridge with cleaner edits, even create new interludes right in your editing software when an edit changes just a little. Imagine the flexibility you have with time in film applied to the musical layers. This is great if your composer can’t help in a time crunch, or even if you are the composer. I used these tricks when I made a short film for Phoenix Comicon a few years ago. I actually wrote and recorded most of the music I used while still writing the script, before I had even shot anything. It came to me in moments of inspiration during the screenwriting and script editing, so I composed and recorded a mini soundtrack as a suite, basically. In video editing, I found some lengths didn’t fit perfectly. Rather than re-record everything to fit my new desired timing, or worse, leaving timing in place on the film but forcing it to match the music despite the visual rhythms’ own desires, I could pull out pieces, or use shorter bars, vamps and stingers exactly how I wanted. And all on GarageBand iOS, with no iCloud or project backup available at the time. P.P.S. It’s called Take Me 2 UR Leader and it was a final selection for the Film Challenge that year, not top prize or anything but a rare group. Plus I made a movie in 30 days where I got to handle everything but the acting roles (well, I did do one). I will tell you that’s great fun but collaboration is really great too.